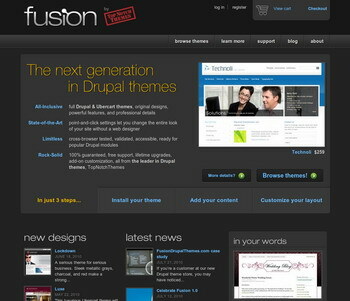 In mid-2009, TopNotchThemes started building Fusion, a theme system that would pave new ground for Drupal themes. Along with this new technology, we started dreaming of our ideal website where products could be deployed automatically, customers had access to a much more friendly account area, and of course a brand new look and feel for this new line of themes. Our current Drupal 5 website at TopNotchThemes.com (to remain active until remaining themes are ported to Fusion) is showing its age and does not have the control we need in order to be able to adapt content and features as our visitors demand. Launched this spring, FusionDrupalThemes.com is not only a showcase for our products, but a wonderful showcase of community and commercial synergy. It integrates Ubercart, Organic Groups, and the Project module suite to create a feature rich platform for selling code-based products.